This week's Retired Item Wednesday item is the Cheesy Holiday Sweater. 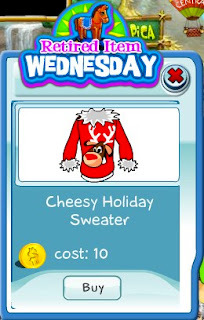 It's almost summer but we are retiring this holiday-themed sweater now. It will be gone forever, so get one today to wear during the winter holiday season.